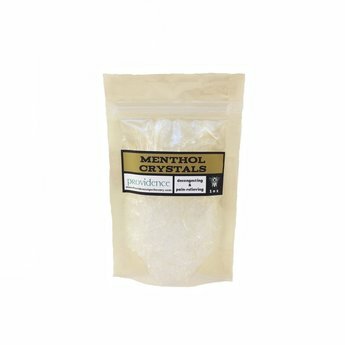 Peppermint oil is subjected to very cold temperatures of about -22C, at which point menthol starts to crystallize and can be separated from the remaining oil. Menthol is one of the chemicals found in many mint plants that give them their distinctive ‘mintyness’. It is a powerfully refreshing and invigorating scent commonly used in balms and chest rubs. It can help with congestion and poor bronchial function. Menthol is also a powerful analgesic and helps control pain in sore muscles and joints. Menthol is such a strong ingredient that only a tiny amount is needed in most preparations. Store in an airtight container in a cool and dark location.